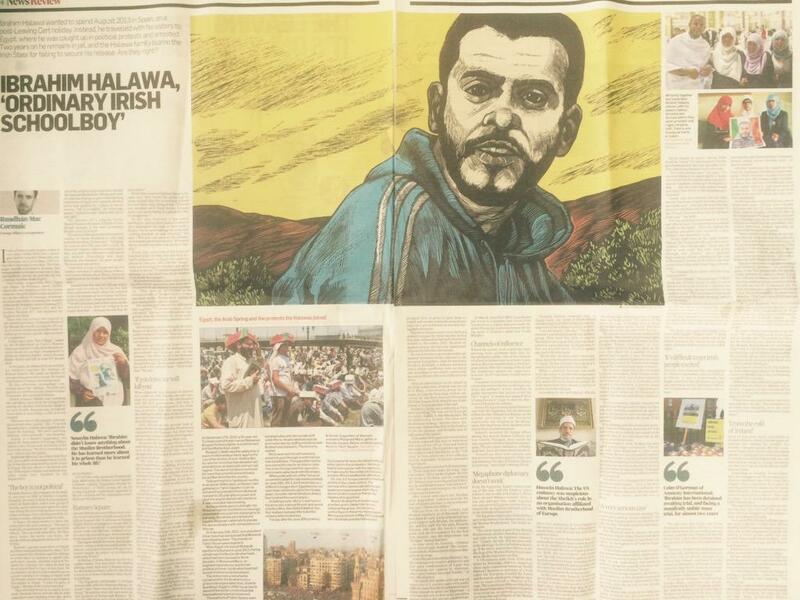 DISCLAIMER: The purpose of this article is only to clearly lay out the facts surrounding the Halawa case and to criticise its coverage by the Irish media. Every important piece of information I have stated is numbered and these refer to sources which may be found at the end of the article. If any of my source material is wrong or misleading please inform me and I will gladly respond or correct it. At the time of writing Ibrahim Halawa has been released from jail and will likely be returned back to Ireland in the coming days. On September 18th he was acquitted of all charges by the Egyptian courts after having spent some four years in jail without trial. The long list of charges included murder, arson, belonging to an armed gang, possession of arms and explosives, violence against police and desecration of the Al-Fatah Mosque (1,2). The issue of his detainment has been one of long-standing public concern and Irish politicians and diplomats have spent some 20,000 consular hours and exhausted all diplomatic options to ensure his release. 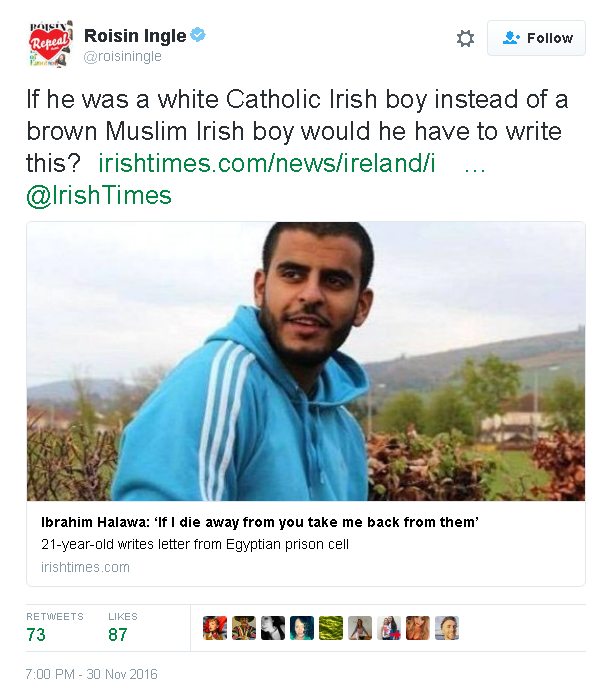 According to the Irish Times, Ibrahim Halawa was an “ordinary Irish schoolboy” on summer holiday with his sisters in Cairo. They were arrested after taking refuge in the Al-Fatah mosque during violent clashes between supporters of ousted president Mohamed Morsi and security forces (3,4). It is my opinion that this portrayal of events is uninformed at best and that the Irish public deserve to know the full story. Why was this video not more widely reported on? And how does an ordinary Irish schoolboy on summer holiday suddenly find himself addressing a crowd of that magnitude and political persuasion? 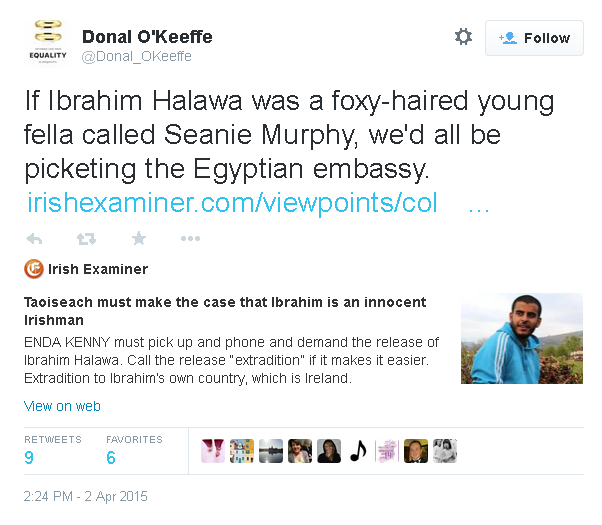 The answer may be because he is the son of Sheikh Halawa, the imam at Ireland’s largest mosque in Clonskeagh. Sheikh is also the Secretary General of the European Council for Fatwa and Research (ECFR), (12) and reportedly has connections to the Muslim Brotherhood. Sheikh Halawa is also reported by Norwegian newspaper VG to have said “But for those who want to push others to become gay, Sharia says it’s a death penalty” (16). Although I vehemently disagree with this view and the one above, I equally believe in their right to say them, unlike the UK government. I wonder, if a similar view was expressed by the leader of the largest Catholic church here, would the media’s reaction be any different? And why does the Irish media, unlike their Norwegian counterparts, choose not to communicate any such views to the Irish public? Is our Taoiseach Leo Varadkar aware of his views? If the father’s connections to the Muslim Brotherhood are true, then it would explain how his children were able to speak in front of crowds of thousands in Cairo. This would also explain why in 2014 the father was offered a deal from the Egyptian government for the release of his daughters. In return he had to publicly recognise the legitimacy of their coup. He refused (12). One may understand the extreme difficulty in making such a decision, but would Ibrahim’s incarceration have been shortened if his father had to given into their demands? The Irish media do not seem interested in the political dimension of Ibrahim’s detention. The video raises the awkward question of whether Ibrahim considers Egypt or Ireland to be his country and does he consider Ireland to be just the country he lives in? And is Ibrahim willing to give his life for his political or religious beliefs? If so, what might these beliefs be? Will the Irish media be prepared to ask him these important questions once he is back in Ireland, say on the Late Late Show? This issue of nationality is made more problematic by the fact that Ibrahim campaigned on behalf of “Egyptians Abroad for Democracy”. In doing so he presents himself as being an Egyptian living abroad in Ireland, and not as primarily Irish or European, despite being born in Dublin and having an Irish passport. Ibrahim does hold dual nationality and it is commonplace for a strong sense of national identity to be preserved in the households of recent immigrants, regardless of formal residency or citizenship. This may explain why Ibrahim portrays himself as Egyptian and feels strongly about Egyptian politics. Why then does the Irish media ignore these facts and continue to portray him as exclusively or predominantly Irish? Now why would the Irish media want to demonstrate how racist the Irish people are? In my opinion it is because they as individuals would rather not pass up a golden opportunity to preach from the perceived moral high ground, rather than do actual journalistic research and report the complicated truth. That would only serve to disrupt their simple narrative. This vacuous virtue signalling provides them with external validation from other like-minded people, especially on social media, and they feel as if they have done something good. But have they in fact betrayed the public’s trust? The issue of trust is a delicate one. Once broken it proves extremely difficult to rebuild. The Irish media have a burden of responsibility to report the truth to the Irish people. If they fail in this regard then we may find ourselves living in a world where reality is distorted by those with interests separate from our own. This is why my article is written with references to all my sources. This is known as open-source journalism and differs from the traditional form because it allows readers to see all the evidence for themselves and come up with their own conclusion. For those who believe they have been deceived by this story and care deeply about the truth, the only solution is to find and build an alternative platform; one that is based upon facts, evidence and commitment to the public good.